Interested in volunteering or have ideas, thoughts or comments you want to share? Go to Get Involved and drop us a line! Rebecca is a leader amongst her peers and someone the class looks to for tutoring on difficult subjects. She frequently is seen sitting with the a younger girlunder a shade tree reading a book or scratching sums in the dirt. We met Rebecca during our last trip and she is friendly, open, and loves attending school. Her favorite subjects are math and geography, and she aspires to be an accountant so she can work with numbers and travel to the big city. As always, the dedication the kids show to their school work and their awareness of the importance of education is inspiring. Education is a tool to achieve big things; to live healthier and more varied lives. 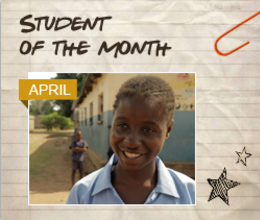 Rebecca understand this and we're proud to highlight her hard work as a Student of the Month!